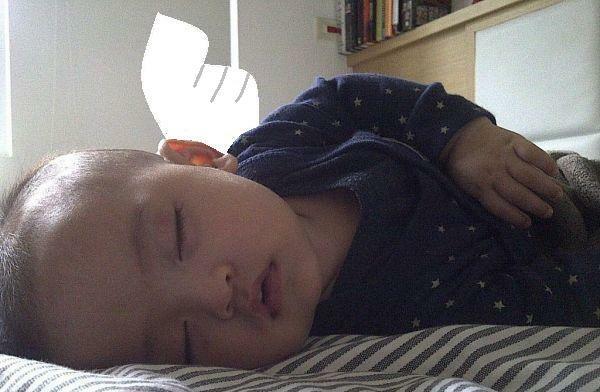 Babies are all angels when they are sleeping. Never mind he/she just ate trash an hour ago, or screamed like a monster 5 minutes ago. Mon bébé had a lunch appointment with IF A-gon & A-ma today. Since he is going through some sort of bonding process, mon bébé gets strong separation anxiety when being an inch away from me. Over the lunch, he cried none stop when someone besides me held him. So I had to eat my supreme steak (cooked for 36 hours) in just 3 minutes and gulp my latte, while holding mon bébé in my arms ALL THE TIME. That was the moment mon bébé was not cute at all. And I wanted to……him (you imagine). But no matter what he had done to me, once he starts to smile, play, or even sleep, he is my angel again. Fashion Tips: Plenty Collection dark grey bodysuit, Carter’s kimono style star bodysuit and Carter’s brown blanket. Mon bébé is a lucky baby. 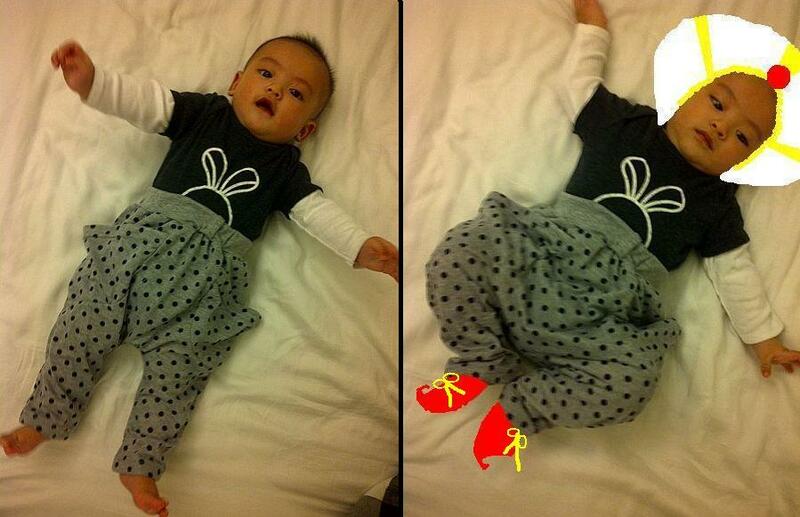 At the age of 6 months, mon bébé already has more shoes than Papa does. 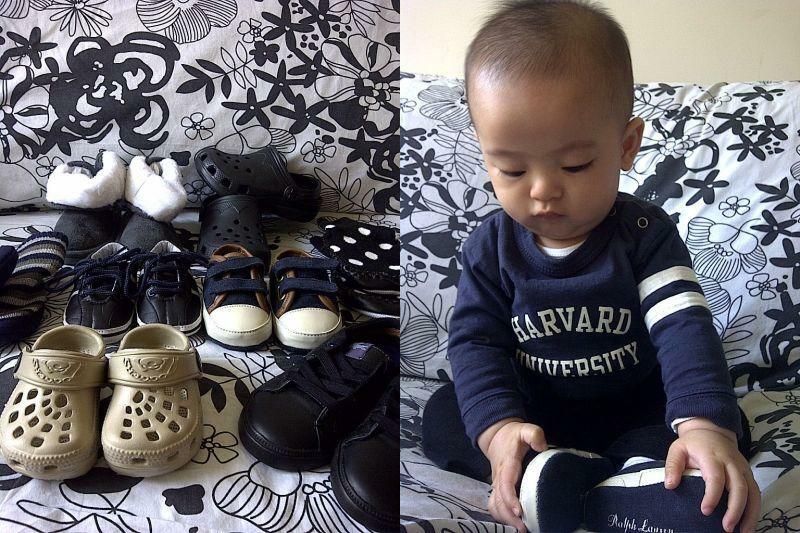 All shoes are gifts from A-gon, A-ma and aunties. Fashion Tips: College Kids Harvard University bodysuit, Jamping Beans pants and Ralph Lauren socks and shoes. Fashion Tips: Baby Gap navy blue stripe top and Baby Gap navy blue leggings. Bathing is one of mon bébé’s favorite daily activities. Mon bébé enjoys kicking and playing water. Papa and I enjoy this bonding moment with mon bébé. It is usually a pleasant time for all of us. 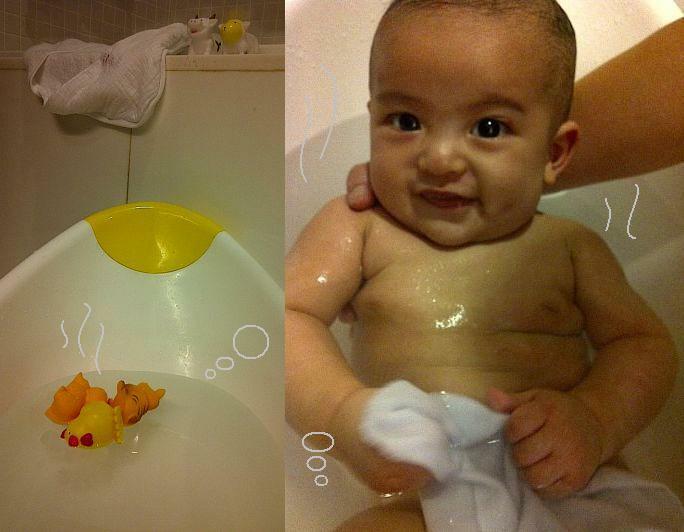 But sometimes, the happy hour can turn into a nightmare in seconds, when mon bébé unconsciously poops during his bath. OH MY GOD…That means, I have to pull mon bébé off the water immediately, re-clean the baby bathtub and refill the water again. Everything has to be done as quick as possible. In the meantime, Papa has to hold mon bébé in towel in case he gets cold. Then, we have to wash mon bébé all over again. Fortunately, it had happened only 3 times so far. 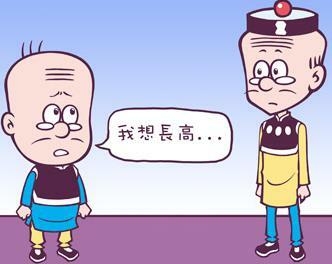 Fashion Tips: the emporer’s new clothes. Papa and I had a dream that one day mon bébé could walk FuFu for us. In the past, we walked FuFu twice a day everyday without exception, even in snowing days when the outdoor temperature was -15°c. Walking FuFu was a big deal in our daily life, and we once wished that walking FuFu would be mon bébé’s responsibility. Sadly auntie FuFu left us last year when I was 3 month pregnant. Mon bébé doesn’t have the chance to get to know auntie FuFu, but at least he can wear her. 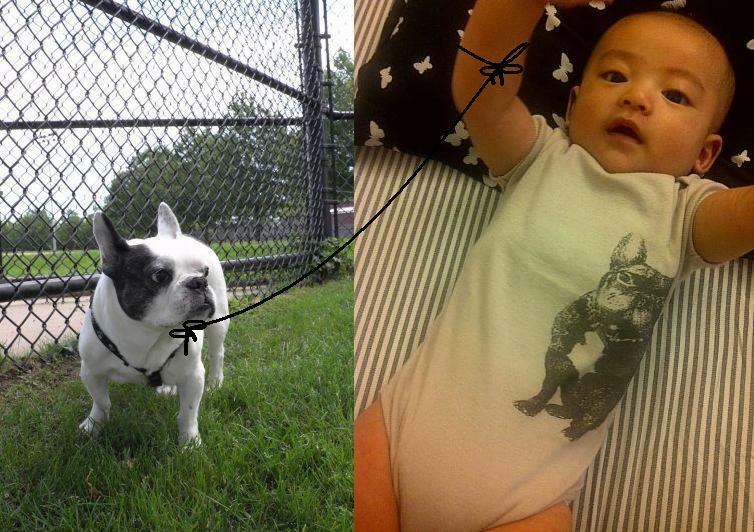 Fashion Tips: Comptoir des Cotonniers french bulldog bodysuit. As summer approaches, more and more mosquitos get into the house, and choose to attack the juiciest skin . Mon bébé is the obvious target. 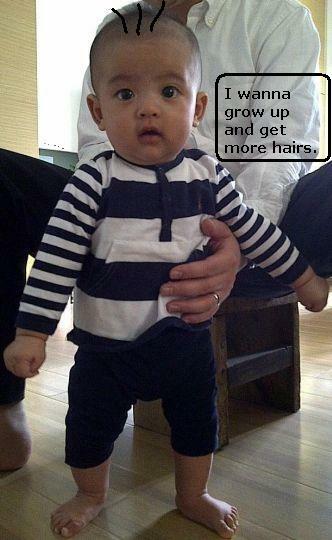 That’s why, mon bébé always has some red bumps on his forehead. Papa and I get very nervous about this. We try to kill mosquitos whenever we see one. With ball, when it rests high. With paper stick, when it flies a bit lower. But the most efficient way is to crush it with bare hands. Several days after our war began, my shooting average is aound 60%, and Papa’s approaches the highest level…99,5%. We call ourselves the Mosquito busters. 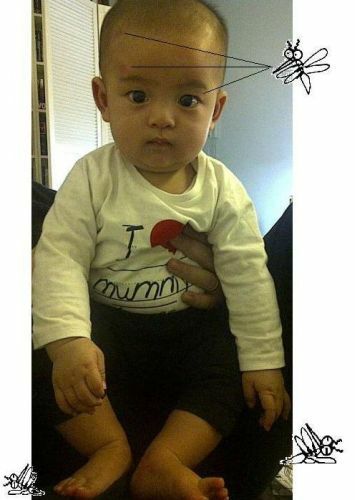 Fashion Tips: Zara Mini I love Mummy t-shirt and Baby Gap blue navy leggings. IF A-gon & A-ma took their day off. Mon bébé got the chance to visit the CP store and played like a grown-up. Mon bébé went into the store, smiling to all sales associates. He sat on the counter comfortably, as if he had done this several times. He supervised the display and oversaw every detail. He was acting like a manager of the day. Fashion Tips: Baby grey bonnet, Bonpoint grey cashmere cardigan, Baby Gap navy blue pants and Old Navy grey socks. A few days ago, Papa showed a series of mon bébé’s photos (taken by auntie Charline) on Facebook. We got a lot of feedbacks. 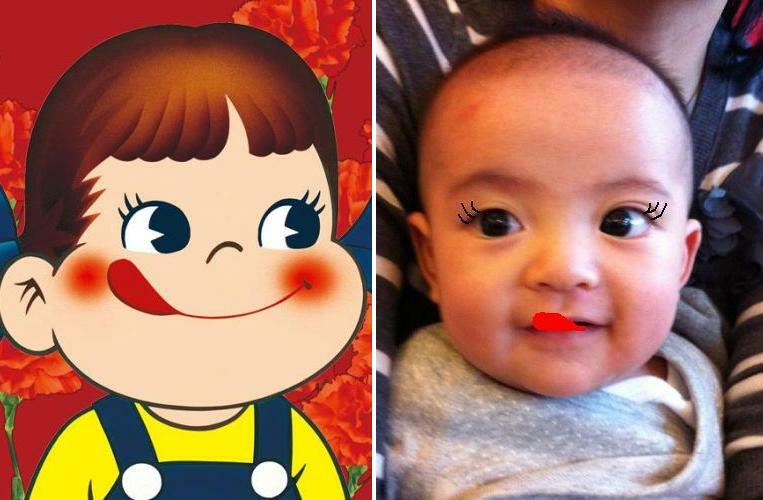 Some friends said that mon bébé looks like his Papa. Others said that mon bébé has A-gon’s expression. But auntie Charline said, mon bébé has Peko doll’s big, round, and naughty eyes; he’s just like Peko’s brother. Fashion Tips: Uniqlo kimono style grey polka dots one-piece and Old Navy white bodysuit. 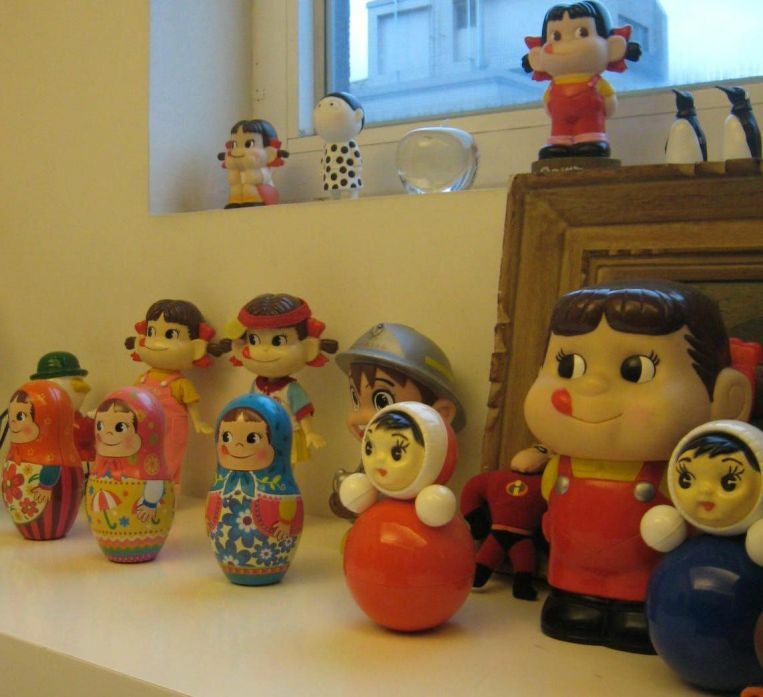 IF A-gon & A-ma’s Peko collection. 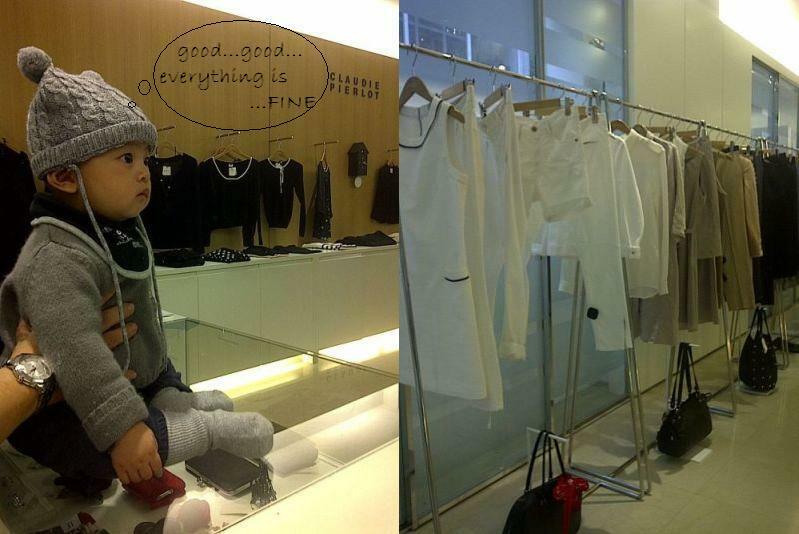 Last month, auntie Joy took me to the traditional day market (中崙市場) to find some children’s clothes. The store was just like an Ali baba’s cave, unorganized but with a lot of treasures. The polka dot pants in the picture were purchased there. Surprisingly, they cost only 100nt (a bit more than $3 dollars). The pants are soft and light, perfect for summer time. They are also very stylish and Made in Taiwan. Fashion Tips: Old Navy white bodysuit and Plenty Collection (Made in Taiwan) rabbit bodysuit. One of mon bébé’s daily activities is flying like a superman. 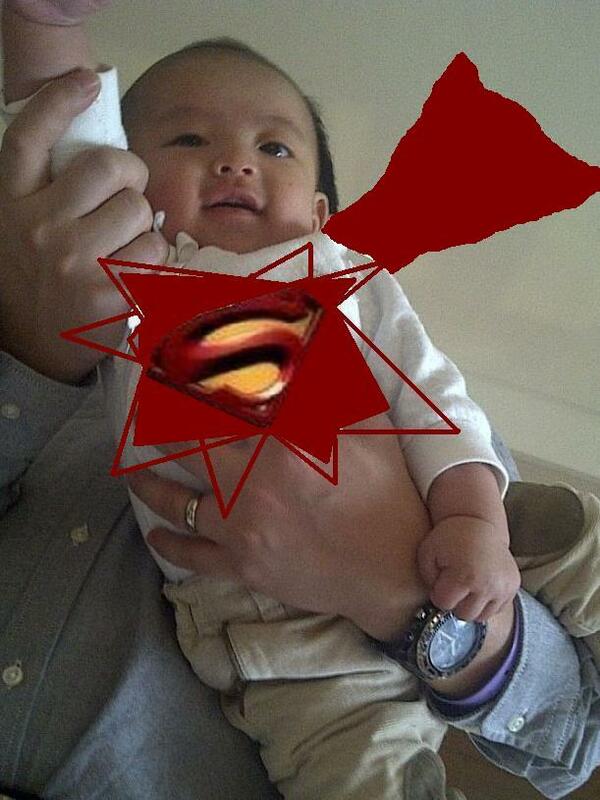 Today, mon bébé finally got his first mission: visiting his one-month old twin cousins and teaching them how to behave like a superbaby. Fashion Tips: Combi kimono top and Zara mini pants.